To say there are a lot of changes is something of an understatement. The situation is still quite fluid, in fact. 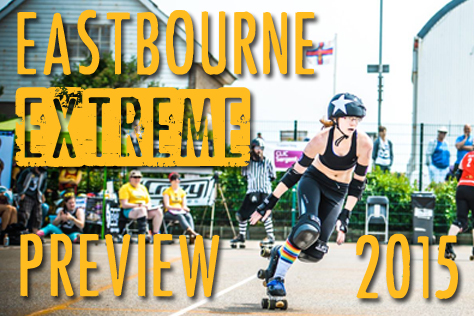 As we were putting this piece together news filtered through that the mighty Bourne Bombshells, although featured on the original map sent out, have now withdrawn from the competition. Geographical factors were quoted as the reason. All four of the leagues Eastbourne were due to face were different to their 2015 Champs opponents. 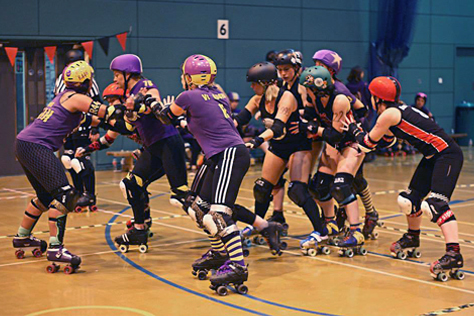 Whilst this year for the Bombshells was dominated by trips to the South Midlands and East Anglia, next year was to have featured opposition from Wales and the South West, and the league decided there was too much travelling involved, especially for a team that includes many with young families. 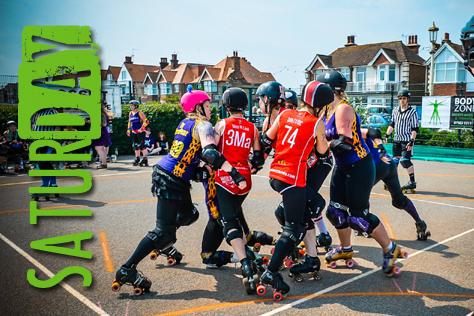 Sussex neighbours the Brighton Rockers have also withdrawn from the tournament for 2016, something they announced just before their final Champs game in August. The absence of both Sussex leagues will affect the make-up of the Southern groupings throughout the pyramid. So who else has withdrawn from the tournament? 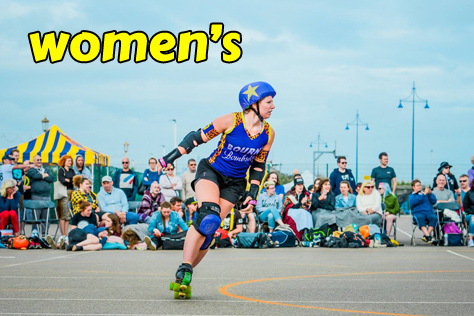 As far as we can tell, another nine teams (so eleven including Brighton and Eastbourne) from 2015’s roster of 72 women’s leagues have walked away. Whilst this is roughly what we had been expecting numbers-wise, it’s somewhat surprising to see that most of the departures have come from the higher echelons of the tournament. 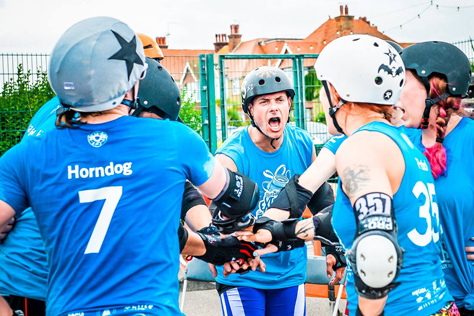 The Rockers mentioned wanting to concentrate on their WFTDA Apprenticeship as one of their reasons for leaving Champs, and it appears that big name teams with strong WFTDA ambitions have prioritised similarly. Meanwhile, the high retention rate at the lowest levels suggests it’s perhaps the ‘smaller’ teams that are getting most of out of British Champs. Having a structured fixture list to follow and building friendly rivalries with other teams from their region looks to be a great step in the development of such leagues. This perhaps shouldn’t come as a surprise, since it’s largely the Tiers 3 and 4 sides of Middle England from which (via End Of The World and Heartlands) Champs has evolved. In percentile terms, we have departure rates of 16.7% (2/12) in Tier 2, 4.2% (1/24) in Tier 3 and 10% in Tier 4 (3/30). So which leagues have withdrawn from the tournament? [NB All of this piece is based on our reading of the map issued by Champs – if we’ve got anything wrong, let us know and we’ll change it asap. This article will be rewritten as and when we are informed of any errors or any further withdrawals.] 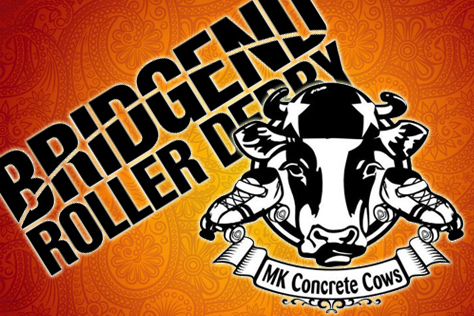 As well as the Bombshells, Tier 4 sees the disappearance of Full Metal Roller Derby from Stevenage. This side was in Eastbourne’s division this year and hadn’t even bouted in public prior to their Champs campaign. It’s fair to say the young side had a fairly torrid season with the worst differential in the entire tournament (an average of -455 points per game). 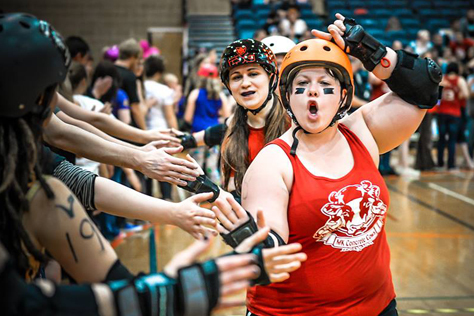 Also leaving from T4 are Central Scotland’s Voodoo Roller Dollies, who finished fourth in their division with one win and three losses. 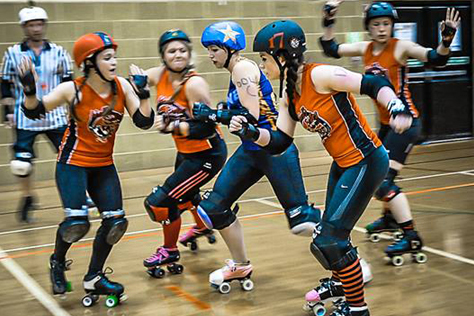 The only departure from Tier 3 is the Hereford Roller Girls, who finished mid-table in this year’s T3 West. 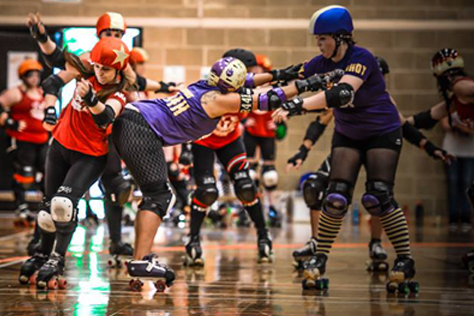 We’ve already mentioned the withdrawal of the Brighton Rockers. Although they took part in T2 South this season, their relegation means it’s in Tier 3 that their space will need to be filled. The other Tier 2 departure comes as something of a shock, being that of Nottingham’s Hellfire Harlots. Hellfire actually won promotion to Tier 1 in the playoffs, so their withdrawal from next year’s Champs seems somewhat surprising. 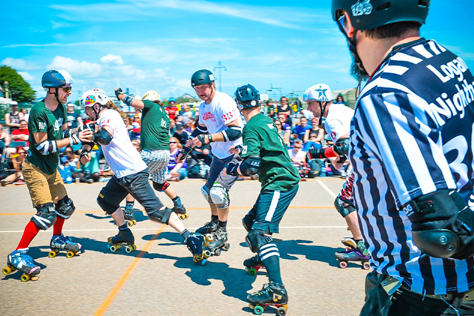 As hinted at in an interview the Champs media director gave the Brighton Rockers fanzine earlier this year, the tournament has twisted its rules to allow a B-team to take part. 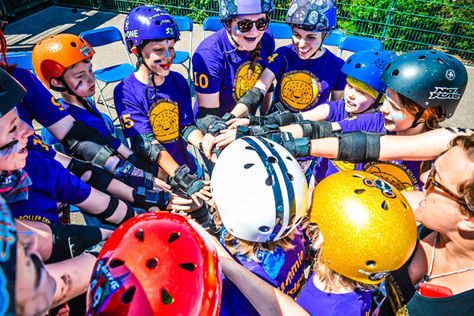 This is the one specific second team they wanted in the tournie from the start; the Brawl Saints of all conquering London Rollergirls. 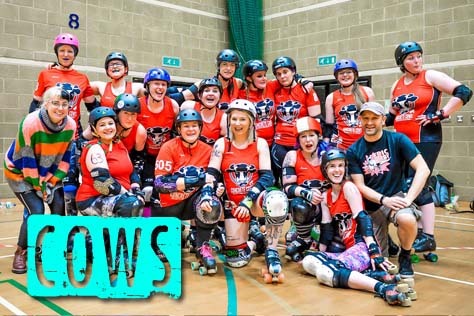 For many years they placed second to only their own A-string in the European rankings, so the Brawl Saints will be amongst the favourites for the 2016 Champs title. Will their inclusion set a precedent that might see the B-teams of other big names (such as some of those 2015 Tier 1 sides who have quit) take part in future years? Maybe so. 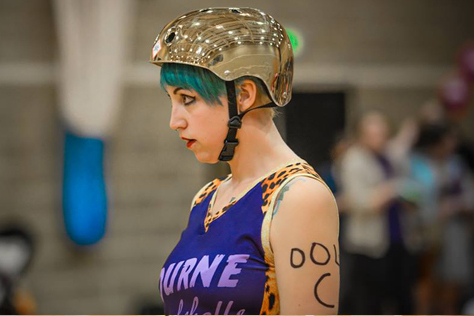 The other new addition would have been Dublin Roller Derby, who would have been very competitive at this level, but they have now chosen not to be involved and to focus on expanding derby in Ireland instead. There may well have been governance issues (UKRDA v IRDA) too, but Dublin are one of our favourite leagues and we are very happy to doff our caps to them in general. There was actually a huge bit here about how their involvement might have been the early stirrings of a Europe-wide Champs here, something similar to football’s Champions League, but since Dublin aren’t actually taking part now it’s all gone to Planet Deleted. Back to the big question though: Who’s going to win Champs in 2016? On the face of it, Glasgow must be the bookies favourites to make it two titles on the trot. They place 4th in the current European rankings, with only Brawl Saints (8th) alongside them in the Top Ten. 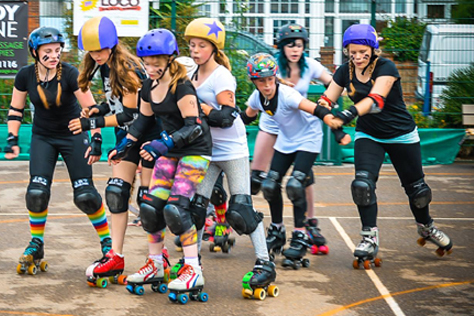 The Londoners do have the resources of one of the biggest roller derby leagues in the world behind them, of course, so can’t be written off by any means. We’re expecting this to be a pretty close two horse race. Newcastle rank 13th and should slot into third at the season’s end. With virtually nothing separating Leeds (22nd) and Windsor (23rd) in the rankings, we wouldn’t want to predict anything for the bottom half of the Tier 1 table. There’s also the question of whether it will be a five team or six team division now. There’s certainly a strong case for LRR (see below) taking the place that had been set aside for Dublin here. The second level features just four of the twelve teams that took part in this year’s Tier 2. With two extra teams promoted and the relegated Tier 1 sides withdrawing from the tournament, Champs were faced with eight empty slots here rather than four. That’s quite handy in maths terms as it means all eight of the teams from Tier 3 playoffs (rather than just the victorious four) get to step up a level. Whilst that does render the whole playoffs process pointless in retrospect, it certainly seems a better option than the alternative of sparing relegated sides. Better to reward success than ameliorate failure, yeah? So with the top two from each Tier 3 compass point (the North, South, East and West divisions) funnelled into the second tier, where is the North/South line on the Tier 2 map drawn? There’s a lot of familiarity to T2 South, with three of this year’s sides – Bristol, Portsmouth and LRR – returning. These are joined by Croydon, SWAT (from Devon & Somerset) and Wycombe’s Big Bucks. 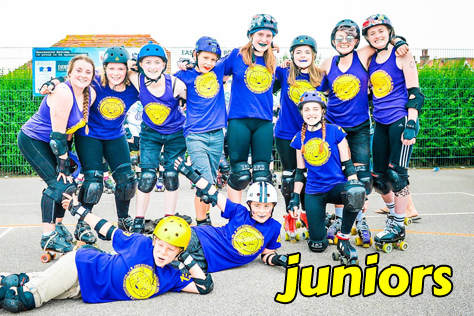 The UKRDA rankings suggest this could be an insanely close division, with barely a slither separating all four of Bristol (15th), LRR (16th), Portsmouth (17th) and Croydon (18th) in the rankings. LRR fared best of the returning trio in the 2015 campaign, but Bristol grew increasingly confident as the season progressed. Keep a close eye on Croydon too – the South Londoners have been rocketing up the rankings since joining the UKRDA earlier this year. SWAT (22nd) and Big Bucks (23rd) aren’t too far behind in the rankings themselves, but we think it could prove difficult for either to escape the relegation slots. There’s a world of change in T2 North, with only Leeds league Hot Wheel remaining from the 2015 line-up. The Yorkshire posse place 13th in UKRDA, which only looks good enough for another mid-table finish in a very tough division. The North looks like being much the stronger half of the second tier once again. 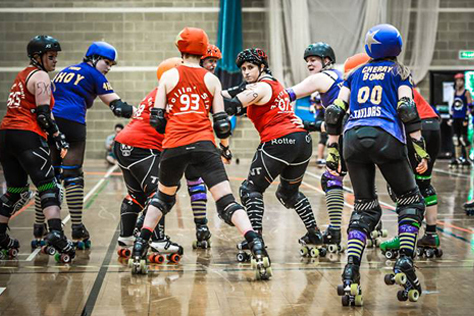 Birmingham Blitz Dames (6th) and Belfast Roller Derby (10th) head up the new arrivals. Birmingham won the entire T3 playoff process last year and have the benefit of the de facto home of UK derby (Birmingham’s spacious Futsal) as their venue. 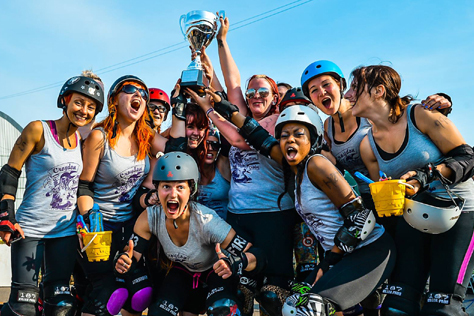 It should be remembered that the Blitz Dames only finished second in their T3 division last year though, so nothing should be taken for granted. 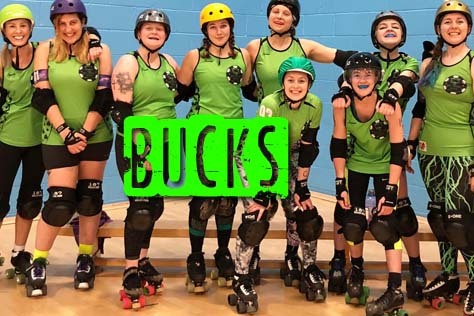 Liverpool (19th), Cambridge (21st) and Cumbria’s Furness Firecrackers (24th) are a closely matched trio, albeit one likely to be battling it out in the lower part of the table if the rankings are to be believed. The upcycling of the four playoff losers leaves Tier 3 short of teams, but in a repeat of the T2 solution all twelve of the Tier 4 playoff teams (rather than the originally planned eight) are promoted. 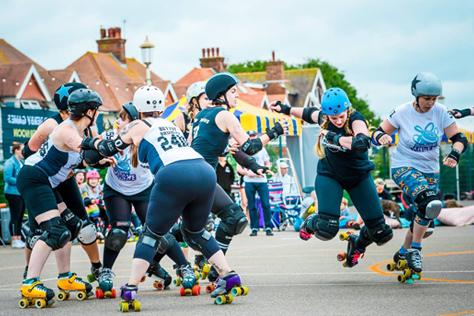 That still leaves two gaps in T3 due to the withdrawal of Hereford Roller Girls plus the Brighton Rockers – the latter’s relegation would have placed them in this tier for 2016. 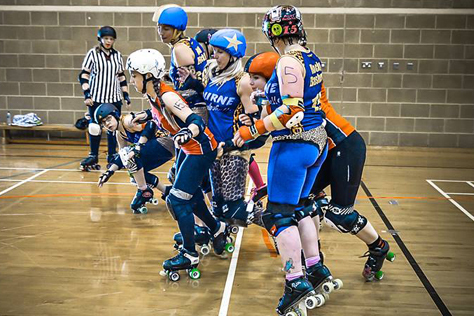 One of these places goes to Champs newcomers Roller Derby Leicester, whilst one of the eight relegated sides is spared the demotion to Tier 4. Conspiracy theorists might note that the team gifted survival (Milton Keynes RD) is the one that many of the organisers of Champs come from, but they did have by far the best season’s record (a minus points differential in the dozens rather than hundreds) of all T3’s relegation spot teams. 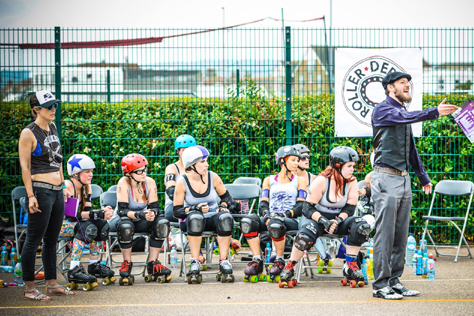 Some geographic redistribution (Kent sent South and Oxford West) means the aforementioned MKRD are the only team remaining from last year in T3 East, with three promoted sides (Norfolk Brawds, Hertforshire’s Hell’s Belles and Essex based Killa Hurtz) joining newcomers Leicester and the relegated Seaside Sirens of Southend in the Eastern quarter of the tier. At this level of the pyramid not every league taking part is a member of the UKRDA, so we’ll have to switch to the European table to compare rankings. 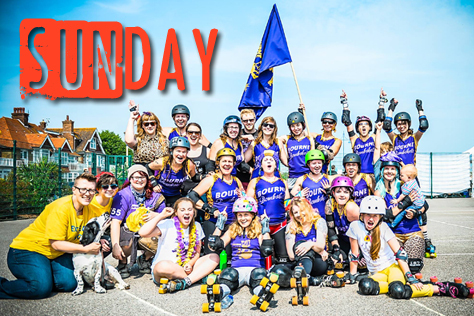 Norfolk (68th), Leicester (71st), Milton Keynes (77th) and the Sirens (82th) place fairly close together and are likely to be fighting it out at the top, with Killa Hurtz (96th) and Hell’s Belles (135th) ranked a notch or so lower. With just 67 places separating the six teams, this is likely to be a tighter race than the other Tier 3 groupings. 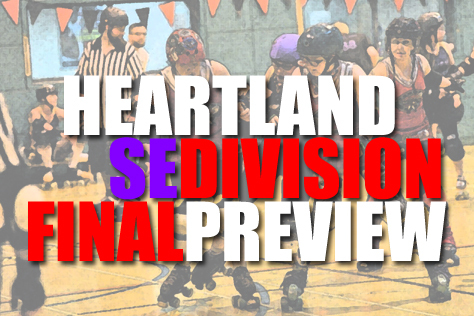 The Northern division features two sides from 2015’s Tier 2 in Manchester Roller Derby (58th) and Hull’s Angels (99th). 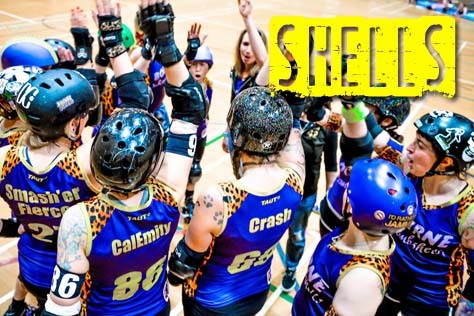 With Sheffield Steel having been moved across to the Western division – a geographically strange move, but perhaps designed so they aren’t paired up with city/venue sharers Hallam – only Dundee Roller Girls remain from the previous North grouping. The Taysiders rank 91st in Europe, a notch above Falkirk’s Fierce Valley (124th). Preston (149th) and Hallam (154th) look closely matched at the lower end of the range. At the other end Manchester, who beat Hull by 74 points on the last day in Tier 2, look early favourites for the title. Over in the T3 West are three teams that played at this level in 2015. Such is the compass point reshuffling that these took part in three different divisions, with only Swansea City returning to same regional grouping. Oxford have ported over from the East, while Sheffield Steel come from the North. There’s a very noticeable rankings spread here, with Swansea 40th, Oxford 61st and Sheffield 103rd. The last of these may be destined for a bottom half battle with two of the promoted sides, Wolverhampton Honour Rollers (85th) and North Wales (141st). The team to watch here is the Wirral Whipeteres, who rank an astonishing 24th in Europe at present. That’s above all but one of the Tier 2 sides, which is quite a position for a team that played in the fourth tier this year. Indeed, the Wirral side are only 0.1 ranking points behind Tier 1’s Windsor! The UKRDA table tells a somewhat different story, though, with Swansea ranked well above the Merseysiders (and most of Tier 2), so the final outcome here could indicate which rankings system we should be putting more faith in. Finally, the South division is the only T3 group with two returning members. The shape of Britain means that these, Cornwall (73rd) and Plymouth City (91st), know each other well. 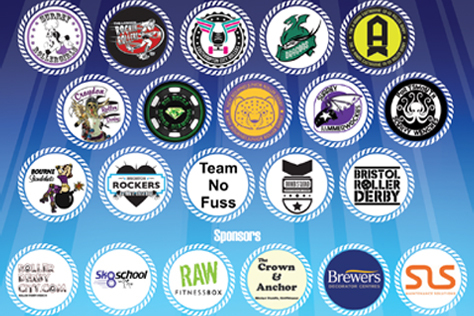 Also from the Western side of the country are the promoted Bath Roller Girls (111th) and Devon’s Grin N Barum (205th). 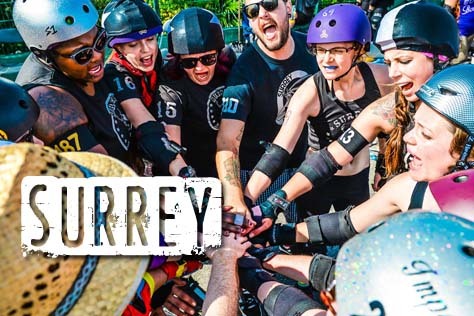 Surrey Rollergirls (170th) and T3 East transfer Kent (69th) are the South East’s representatives in this very West-titled division. 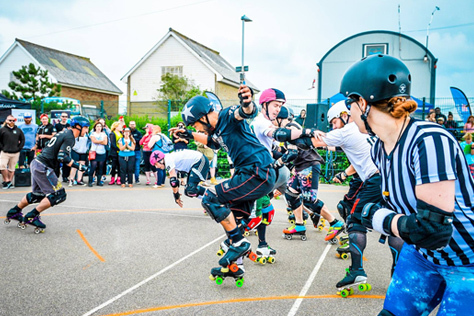 The rankings suggest a coast to coast battle between the sides skating out of Herne Bay (Kent) and Penzance (Cornwall) for the title here. If the geographical tweaking in Tier 3 was confusing, that in Tier 4 is even more widespread. Much of the reason for this is that the fourth tier is shrinking from six divisions to four. This makes a lot more sense as they now match up in name with T3’s compass points – we were awfully confused by 2015’s T4 North and T4 Central North, for example – and promotion/relegation becomes less of a juggling act. There’s no point us saying who has stayed in the same division as 2015 here, since the axing of two groups means it’s all change all round. 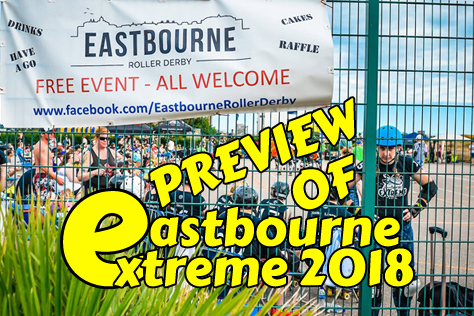 We can say that three teams have withdrawn (Voodoo Roller Dollies, Eastbourne and Full Metal), two new teams have joined at this level (Durham and Rebellion) and four teams have been sent down to the brand new Tier 5. Had they not withdrawn late on, the Bombshells would have been taking part in T4 South, where their shortest journey would have been to that other ‘Bourne’. 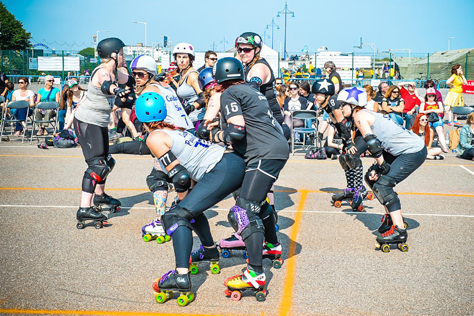 Bournemouth’s Dorset Rollergirls (123rd) are likely to be battling it out with Gloucester’s Severn Roller Torrent (113th) for the title, with the lower half of the table likely to be a tussle between the Welsh duo of Bridgend (232nd) and Newport’s Riot City Ravens (184th). With only four teams remaining, the fixtures for this division will take a little tweaking. Curiously the T4 Northern division contains six teams, whilst the East and West each contain five. All the T4 groups had five teams in 2015, and we wonder whether Champs might be tempted to try and shuffle the packs to balance it out. If so, this would likely involve a team from the West joining the South division (which is actually more West than the West!) and a North side replacing them. It’s possibly too late in the day for that, now. 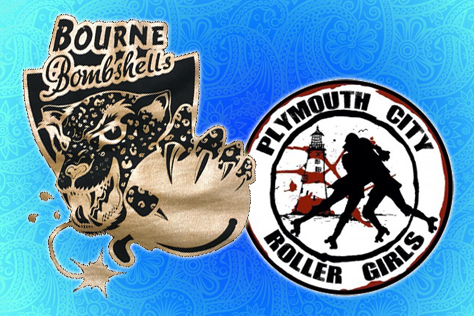 The Bombshells’ only 2015 opponent remaining in the fourth tier is Suffolk Roller Derby, who have been placed in T4 East for 2016. The Ipswich league rank 273rd in Europe, making them – like the Bombshells prior to their withdrawal – easily the lowest ranked side in their division. The incorporating of seven relegated sides amongst T4’s 21 seems to have strengthened this tier throughout. The favourites here are the Lincolnshire Bombers (159th). 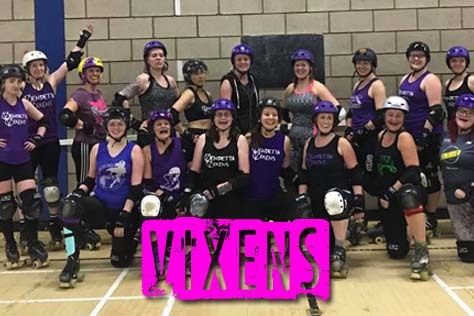 This grouping is very closely located not just geographically, but also in ranking terms, and we can expect some pretty close games amongst the trio of Peterborough’s Borderland Brawlers (206th), Northampton’s Vendetta Vixens (208th) and Champs debutants Rebellion from Bedford (213th). Whilst the East has a lot of closely matched teams, the rankings spread in the T4 West is huge. This grouping features three teams that finished fourth (with one win and three losses) in their respective Tier 4 division this year. 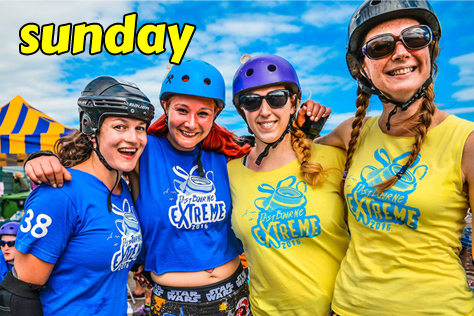 These are Mansfield Roller Derby (249th in Europe), Evolution Rollergirls from Shrewsbury (316th) and Coventry City (363rd). 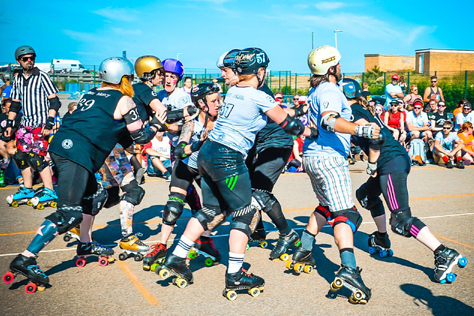 The favourites here will be Nottingham Roller Girls (102nd) and Leicester’s Dolly Rockits (156th). These two sides know each other well, having been relegated from the T3 West together. 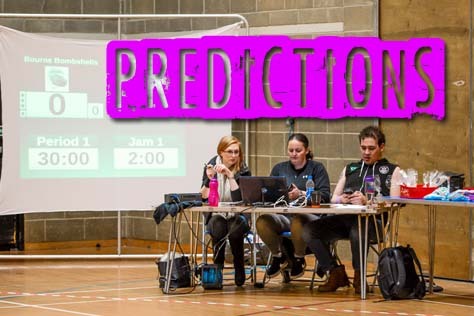 Nottingham won the Tier 3 encounter by a squeaky close single point (162-161 on the final day) so it would be brave person to predict the table topper here! Finally the six team T4 North. Again, the sides that have come down from Tier 3 are the highest ranked here, being Aberdeen’s Granite City (105th) and Halifax Bruising Banditas (165th). Both Harrogate’s Spa Town (172nd) and the Blackpool Roller Coasters (180th) did well at this level in 2015 and look like giving the Banditas a run for their money. Champs newcomers Durham place 224th in Europe and might find the division a bit of challenge. 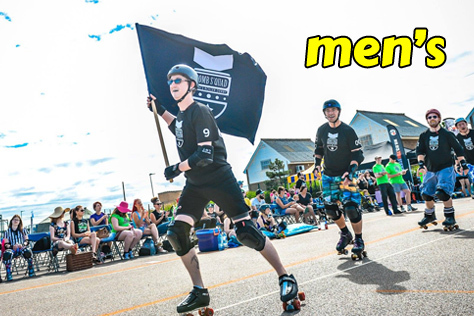 This is certainly true of Livingston’s New Town Roller Girls (379th), whose -1507 differential from their four Champs games in 2015 was the tournament’s biggest deficit after that of Full Metal (who aren’t taking part in 2016). The newly formed Tier 5 consists of a single division of six teams. It might seem strange to not divide the lowest level by regions – increasing the travel times and costs of the competition’s newest/smallest leagues – but most are located across a broad swathe of Wales and Middle England. Or Middle Earth even, since ‘The Shires’ are well represented in Cheshire Hellcats (ranked 310th in Europe), Wiltshire (342nd), Bedfordshire (376th) and indeed West Yorkshire’s Wakey Wheeled Cats (265th). 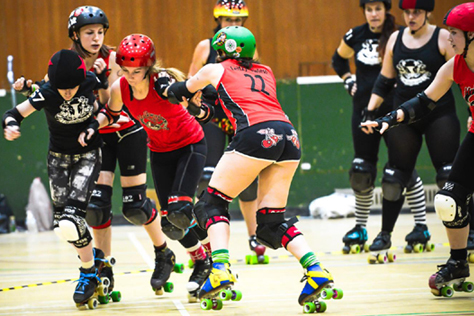 Neath Port Talbot (266th) and Swansea’s Reaper Roller Derby (unranked) provide the Welsh element. Of these six sides, Cheshire and Reaper are new to Champs. If the rankings are to be believed, this division could be a two-way tussle between the Wakefield and Neath sides. 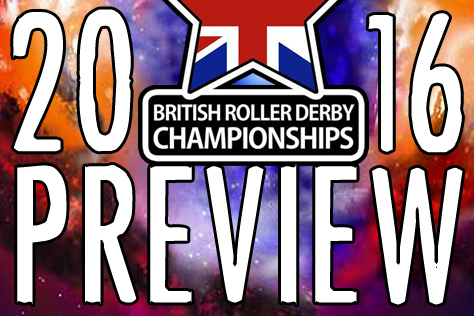 Since we have based our preview on nothing more than a map, we’re not entirely sure how promotion and relegation between Tiers 4 and 5 will work, so keep an eye on the British Champs website and Facebook for news of that and the official release of the fixtures. 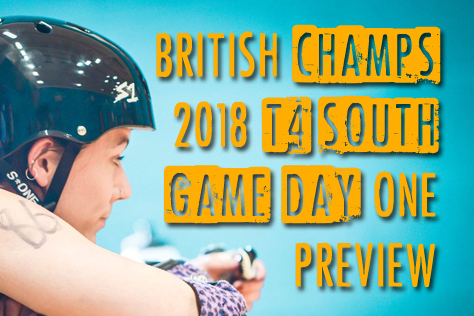 It’s not all about the women in Champs, and (in keeping with the rapid expansion of men’s roller derby in the UK) the male element of Champs has grown by nearly 50% for 2016. Instead of fourteen teams taking part there are twenty. But is the battle at the top of Tier 1 going to be as close as this year? Southern Discomfort won the title with +1 points differential over South Wales Silures, beating them by exactly enough on the final day to nick the title. In fact three teams tied on six points this year, with third place Tyne And Fear the only team to beat SoDisco. 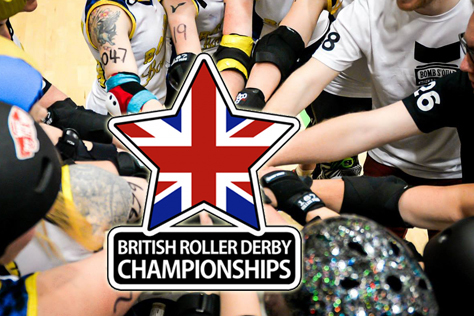 The Londoners currently place 7th in the world in men’s derby, with the Geordies 9th and the Welsh 10th. Add the fourth returning T1 team Lincolnshire Rolling Thunder (13th) to the mix and you can see how closely matched these teams are. 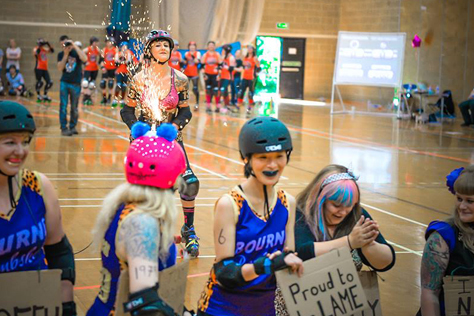 Of the two sides promoted from Tier 2 to make this a six team division, Manchester’s New Wheeled Order place 16th and Cumbrian side Barrow Infernos are 23rd. By our maths that’s 25% of the Top 24 sides in the MRDA (ie global men’s derby) right here in this little division. Strewth! 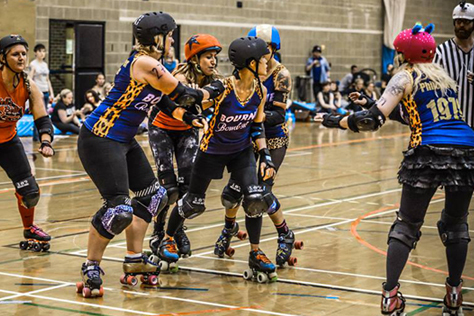 The second tier remains at six teams, with Sheffield’s The Inhuman League (34th in the MRDA) the highest ranked team here. 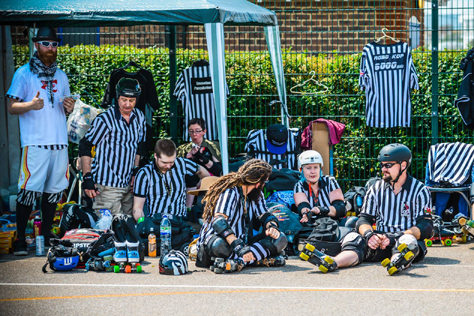 Of the other teams spending a second year in Tier 2, only Milton Keynes based The Quads Of War (38th) have an MRDA ranking, although the Crash Test Brummies joined the organisation this year and should be ranked soon. 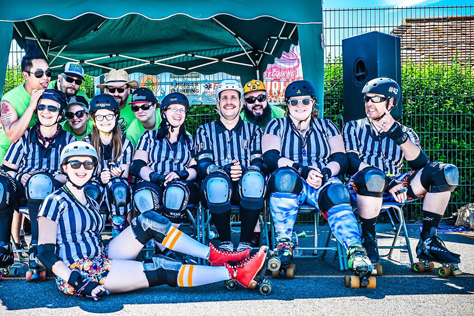 The Super Smash Brollers (Nottingham) is the other T2 returnee, and this quartet are joined by the promoted Kings Of Block And Roll (Devon & Somerset) and Wirral Pack Animals. The Sheffield and Birmingham sides are probably the ones with the biggest title aspirations here; TIL won the two sides’ 2015 Champs game by 54 points. The biggest expansion is at the bottom of the men’s pyramid. This year’s Tier 3 consisted of a single four league division, whereas 2016 features two of that size. In the T3 North, only Aire Force 1 from Leeds took part in the 2015 tournament. They’re joined by the Sons of Icarus (North Wales), Skateful Dead (Halifax) and Teeside Skate Invaders. 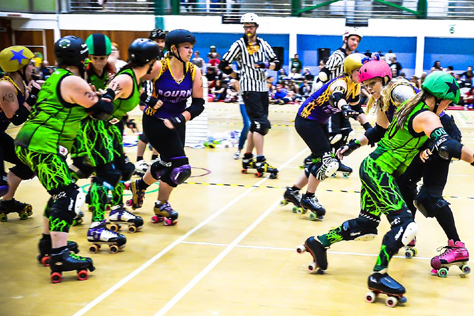 The Southern division features the Bristol Vice Quad alongside three debutants; Suffolk Roller Derby, Nottingham Outlaws and Hereward Hitmen. The last of these are something of a mystery to us. We couldn’t find any information about them online and the Champs tournament map shows them as being based in a field in the East Midlands miles from civilisation. They sound pretty feral, huh? Logic suggests the two T3 teams with experience of this year’s Champs should be favourites in these divisions, but with so many unknown quantities involved, we wouldn’t want to predict anything here. In summary, we hope this (typically overlong) piece has been of interest to someone somewhere. 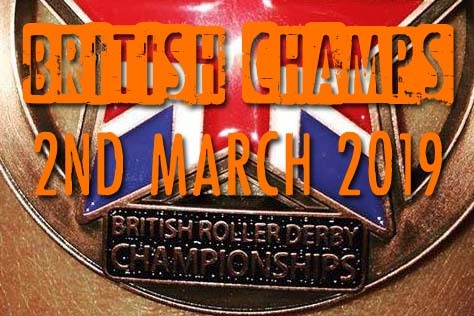 Do keep any eye on British Champs’ own website and Facebook for the release of the 2016 fixtures. Cheers muchly.